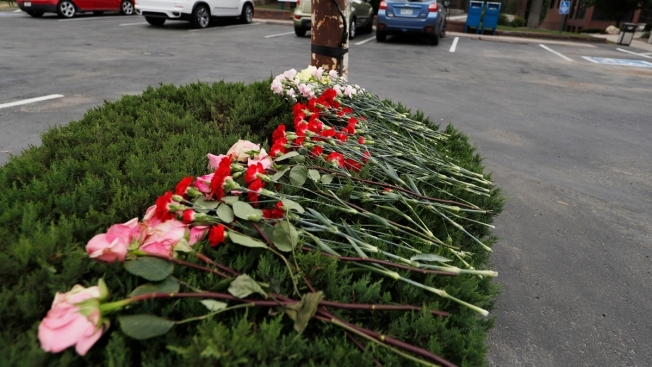 "I am heart broken over this senseless act, the whole world is praying for your family"
Flowers line the top of a shrub in the parking lot that was the scene of a shooting outside a dental clinic Friday, June 15, 2018, in Westminster, Colo. Four people were shot outside the complex in the northwestern Denver suburb. Nearly $100,000 has been raised in two days for a Colorado family dealing with an unspeakable tragedy following a road rage shooting that left a 13-year-old dead, and a mother and a second younger son in critical condition and "fighting for their lives." The GoFundMe account set up to help the family of Meghan Bigelow has drawn nationwide attention. After sending in a donation, Leann Parkinson wrote, "I am heart broken over this senseless act, the whole world is praying for your family." Abby McMaster of Erie, Colorado, created the page, along with the Bigelow's family and friends, to ask for help with "raising money for this incredible family as they are experiencing such are tragic time and have a long road of recovery ahead of them." A 12-year-old boy told police he saw a driver open fire on his family during a road rage confrontation in Colorado, which killed his older brother and critically wounded his mother and younger brother, authorities said Friday.